This unique dual opening credit card holder with money clip has one section with slots to hold 6 credit cards, and another section that has a flap to hold additional credit cards or business cards for easy access. 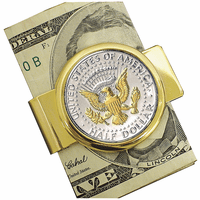 In the crease of this section is a silver-tone hinged money clip that can easily hold 10 to 15 bills. 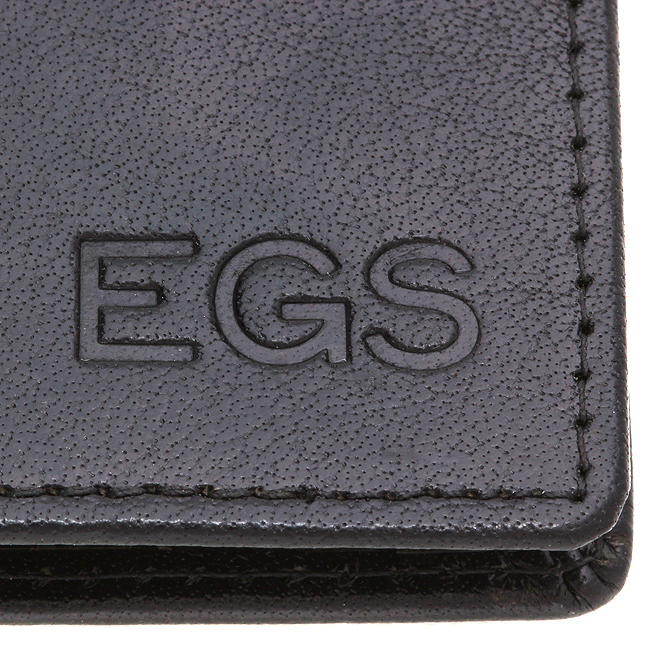 The wallet is available in black or red genuine leather, and can be personalized with hot stamped initials in the lower front corner. 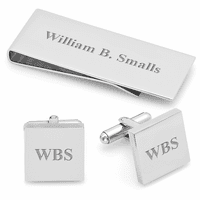 It is packaged in a gift box for presenting at a birthday, holiday or graduation to one of your favorite guys! To add free custom personalization, just enter your lettering in the personalization field above. Dimensions: 3 1/4" x 4 1/8" x 3/4"
Personalization does not slow order processing time, your order will still ship the next business day. 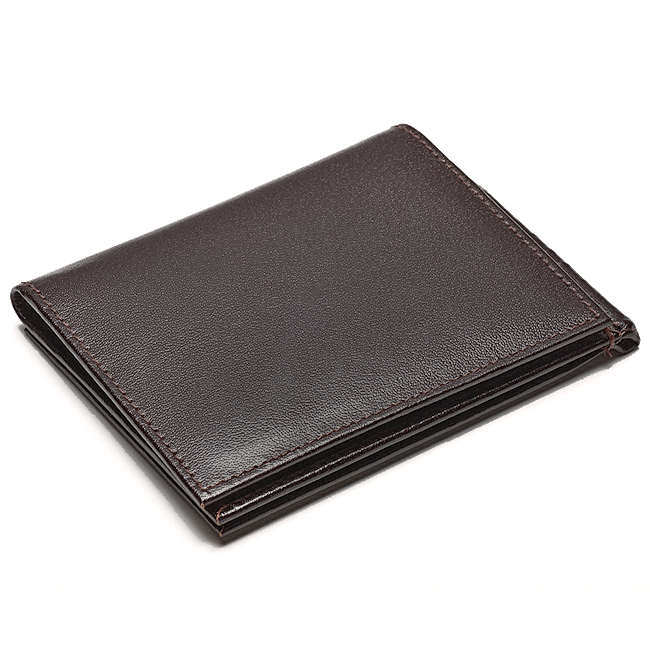 The wallet portion is made of genuine leather and the money clip part is made of stainless steel. 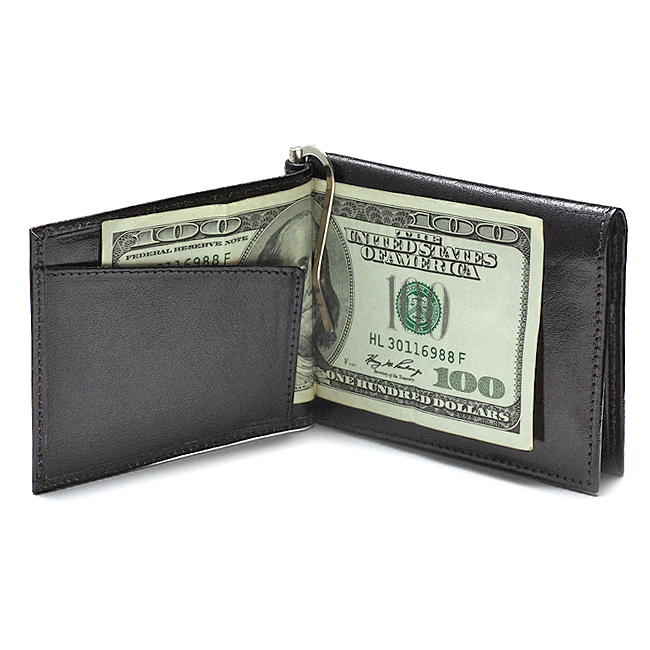 It is a hinged metal bar, with an arch that folds down to clamp on your money in the fold of the wallet. We do ship outside the USA, just choose USPS International Air Mail as your shipping method. We can only hot stamp up to 3 letters, which is free of charge. We can't hot stamp more than that. We don't have a picture of the money clip section, but it is just a hinged metal clamp in the fold of the wallet that snaps down on your bills. 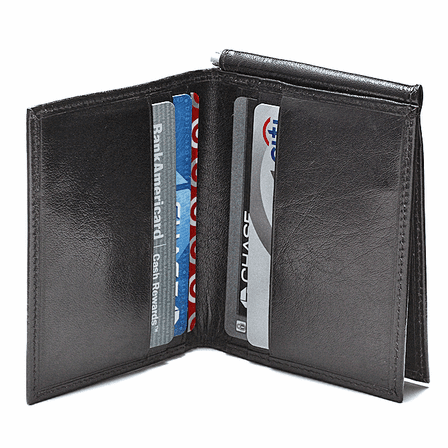 I'm very interested in the Dual Opening Credit Card Holder with Money Clip but want to know what type leather it is made of. It is made of genuine cowhide leather. 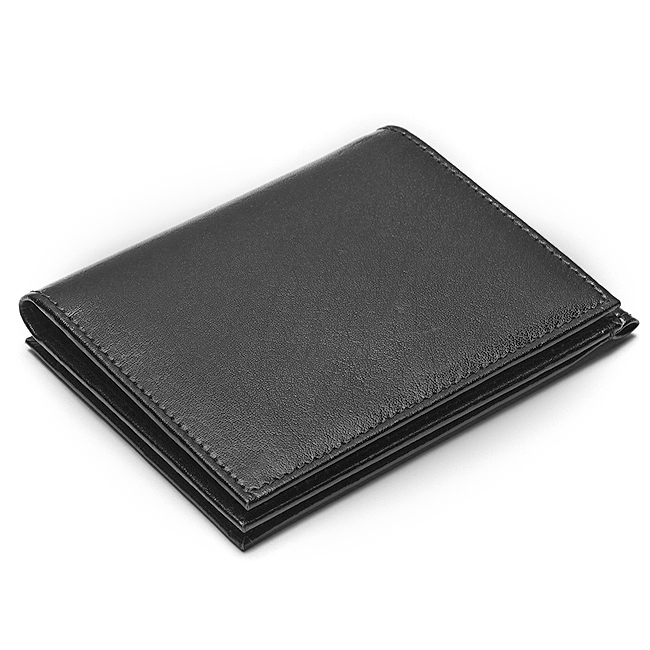 What type leather is used in the bi-fold wallets??? They are made of genuine cow-hide leather. Can all of your money holders for men be personalized? 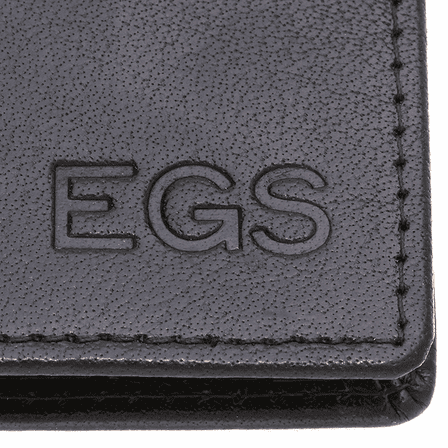 How are the personalized and where is it done on the wallet or money clip? Yes, they all of them can be personalized. Just check the PERSONALIZE box above the Add to Cart button to open the personalization options window. The initials you specify are hot stamped on the bottom right hand corner of the front cover. I just ordered my third one. I love this style wallet. It is well constructed and seem to last about 4-6 years. By Larrier G. Walker Sr. 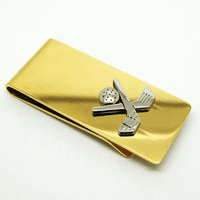 I have been looking for this type of money clip for quite some time. It is perfit.